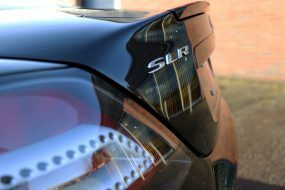 New Car Protection – Why Choose An Independent Detailing Studio? 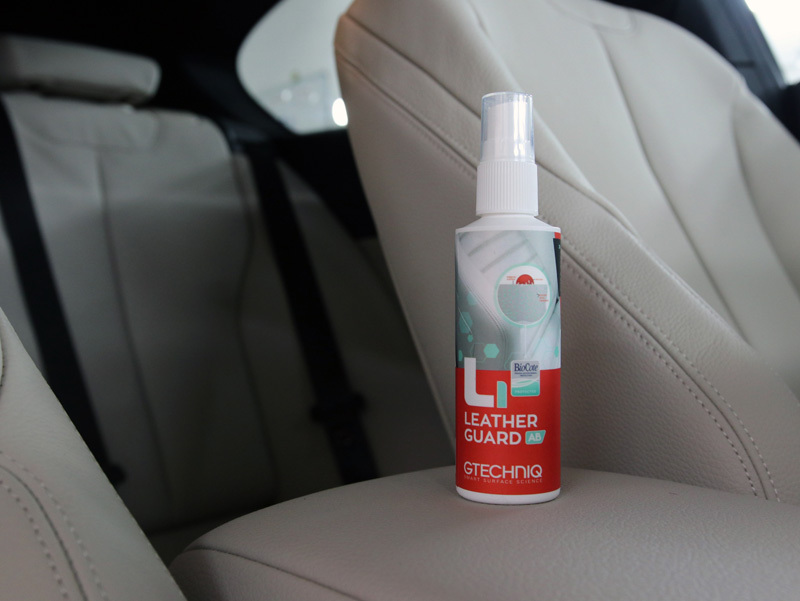 Home - New Car Protection – Why Choose An Independent Detailing Studio? For many, the purchase of a new vehicle represents one of the largest financial events in life, second only to a mortgage. As a result, it makes sense that as a new owner, your priority is to ensure that investment is protected to preserve its aesthetic appearance and by extension, its resale value. Having a New Car Protection Treatment is the ideal way to ensure a new vehicle receives the best start in life. However, not all New Car Protection Treatments (NCP) are created equal and the key elements to consider are who is offering the package and why. Dealerships offer New Car Protection Treatments as part of the original sale of the car, it’s just one of the many options buyers are presented with. 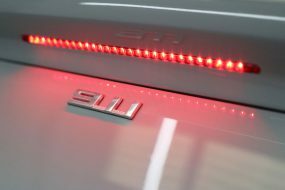 It may seem like a good idea at the time, however, it’s worth bearing in mind the key objectives of the dealership: to make money selling as many cars as possible, upselling and cross-selling wherever possible. With this in mind, is it reasonable to expect the dealership has researched the protective sealant fully? Do they have the knowledge and experience to evaluate the range of coatings available? Unlikely. Their primary focus isn’t on the aftercare of the vehicle and their expertise is not within the coatings market. Furthermore, given their primary objective, are they likely to select a coating based on performance characteristics and longevity? Or is it more likely they’ll select a coating based on cost-effectiveness and speed of application? 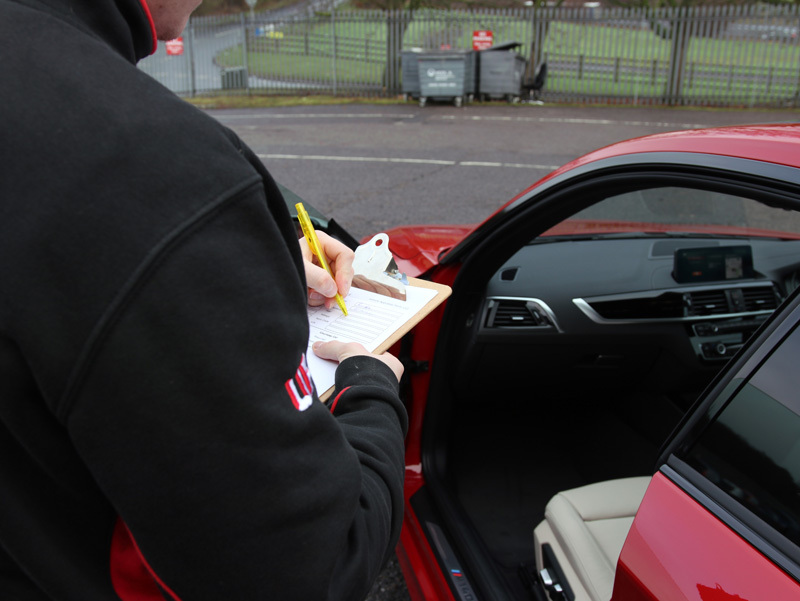 When a new car arrives at a dealership, the protective films, foam guards and identifying stickers are removed and the car washed and dried, ready for collection. As a consequence of all this hurried activity, often paintwork becomes scratched and swirled. Sometimes, the vehicle is prepared by polishing with a light abrasive containing fillers to mask any imperfections. 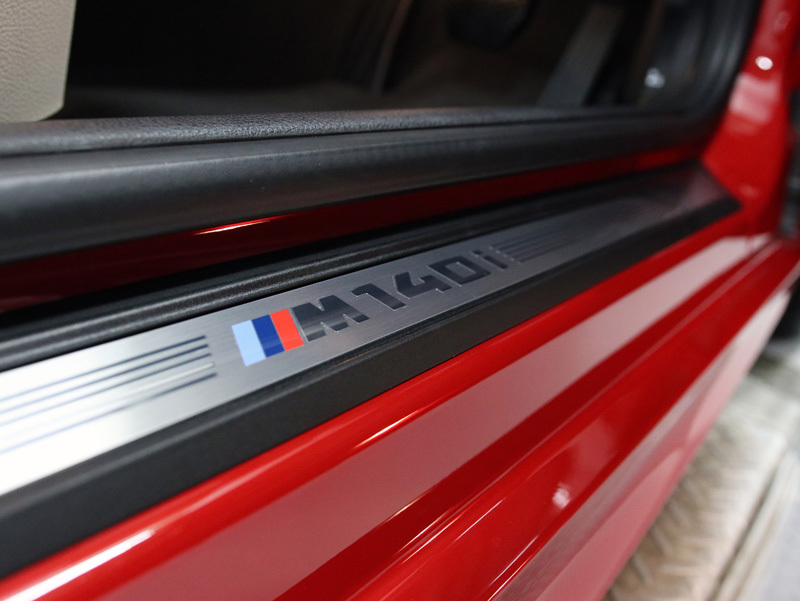 If the dealership protection package has been purchased, the coating will be applied over the top of the filler polish, as quickly as possible to make room for the next vehicle. This means the imperfections are sealed beneath the coating. The coating won’t bond properly with filler polish and therefore won’t last as long. 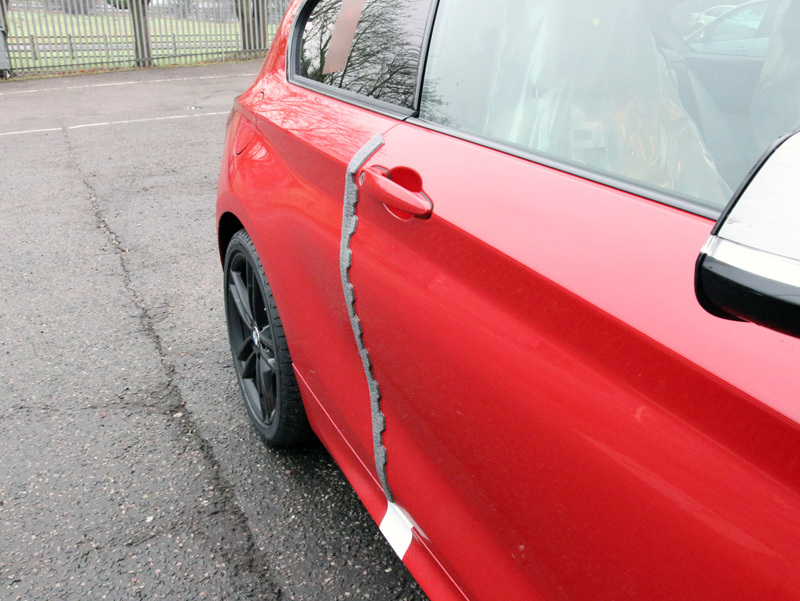 As a buyer who has purchased a New Car Protection Treatment, typically at a cost of £500 or more, specifically for the long-term protection benefits it offers, this is not ideal! So, are there other options, rather than relying on dealerships whose primary focus is sales? The short answer is yes. The priority of independent detailing specialists is identical to that of the owner: the preservation of the appearance of the vehicle. 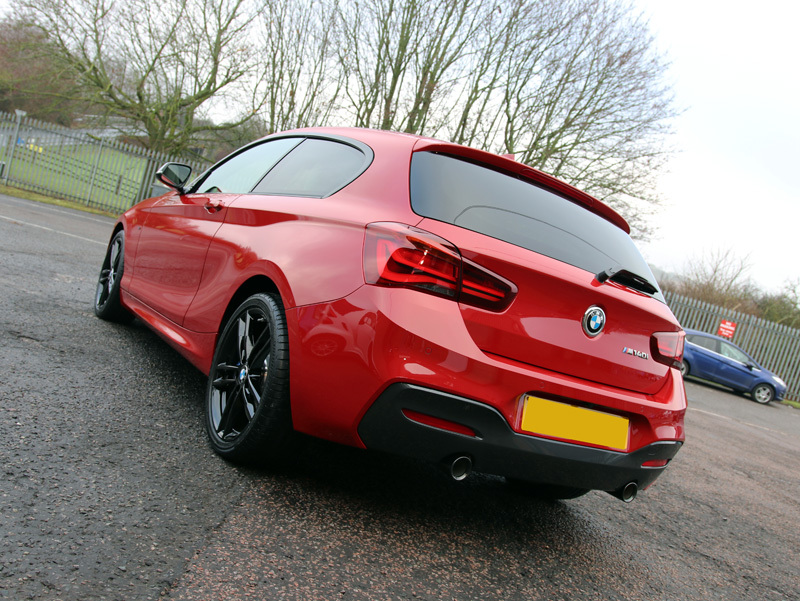 Detailers rely on their work to stand as a testament to their skills and abilities in order secure business and therefore, their priorities are more closely aligned with the car’s owner. Furthermore, because their focus is detailing, they have extensive knowledge of the most advanced coatings available, as well as experience as to how they perform. 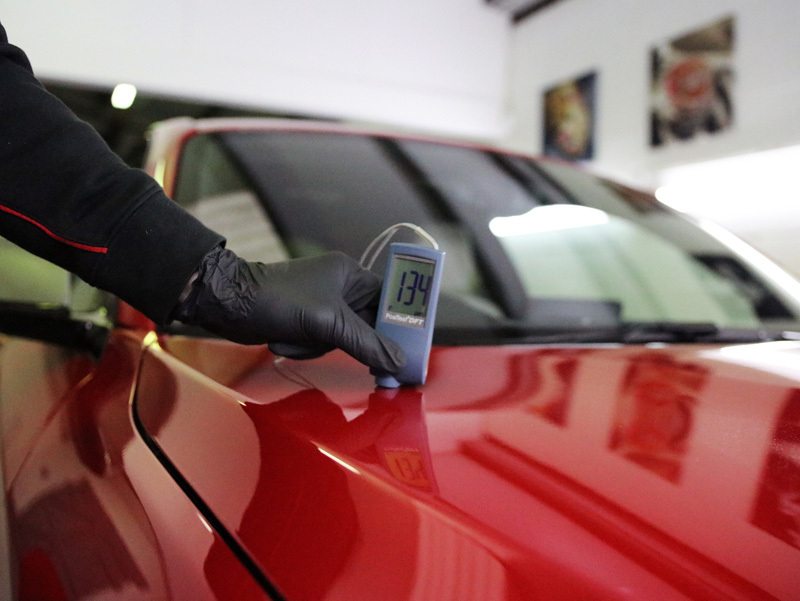 Detailers select the coatings they use on the basis of their performance and durability. Detailers tend to work on one vehicle at a time, so new car owners can rest assured their vehicle is receiving undivided attention and the service is uncompromised by competing priorities. 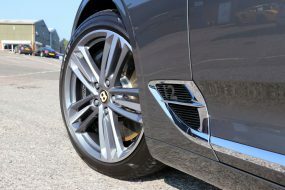 For new car owners keen to ensure their vehicle receives the best possible treatment, right from the start, the ideal solution is to have the new vehicle delivered to an independent detailing studio, untouched by the dealership in any way, with the transportation protective equipment still in place. 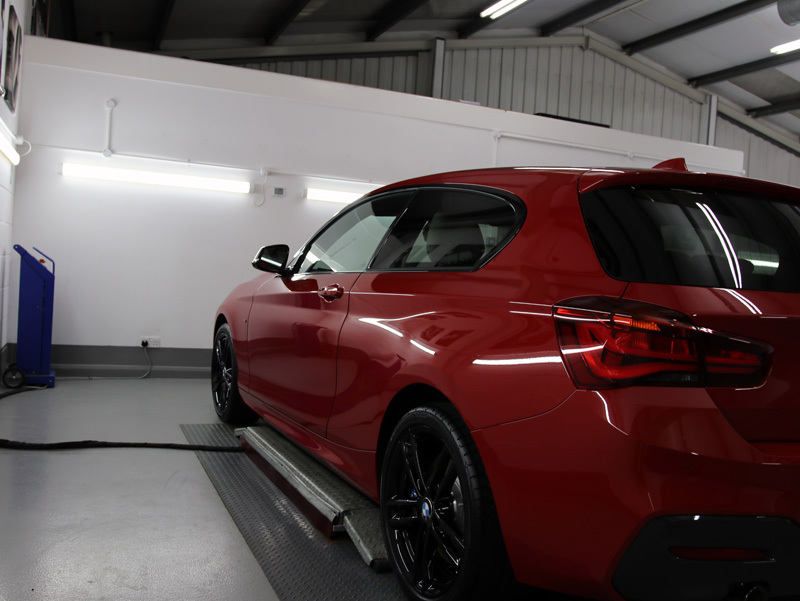 The detailer will then take the appropriate steps to ensure no damage is inflicted on the paintwork, remove all the protective films and use specialist products to ensure the car is thoroughly decontaminated. 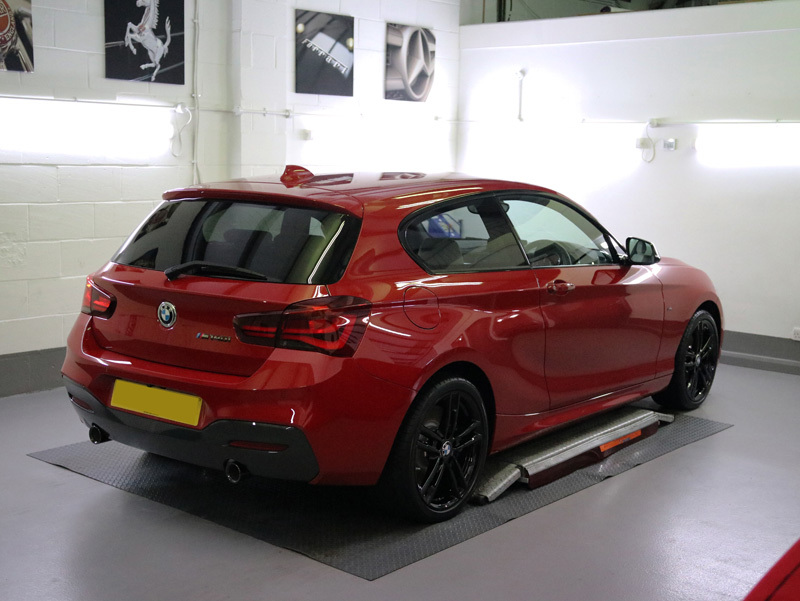 Here, a brand new BMW M140i is used to demonstrate the level of care that should be taken over the preparation and presentation of a new car, as well as the processes involved. 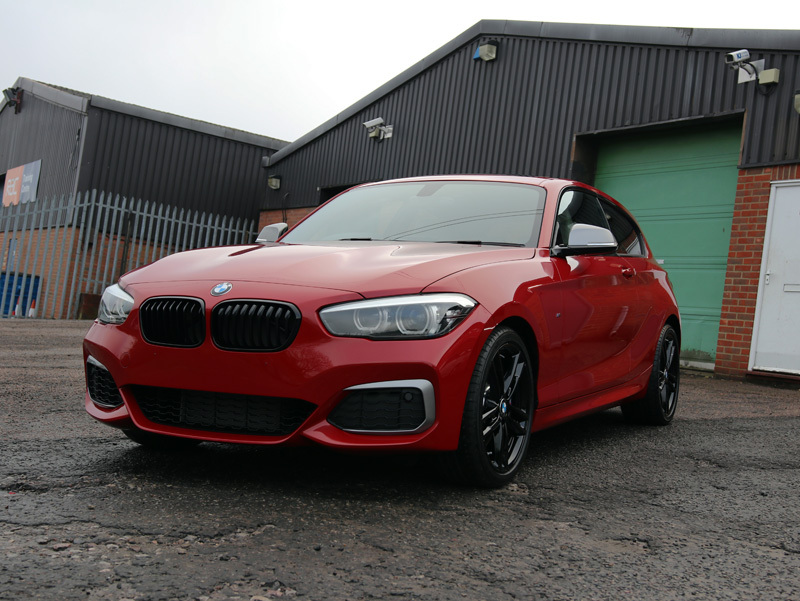 This BMW M140i was delivered to UF Detailing Studio at Brands Hatch, Kent, complete with all transportation films in place, cosmetically untouched by the supplying dealership. 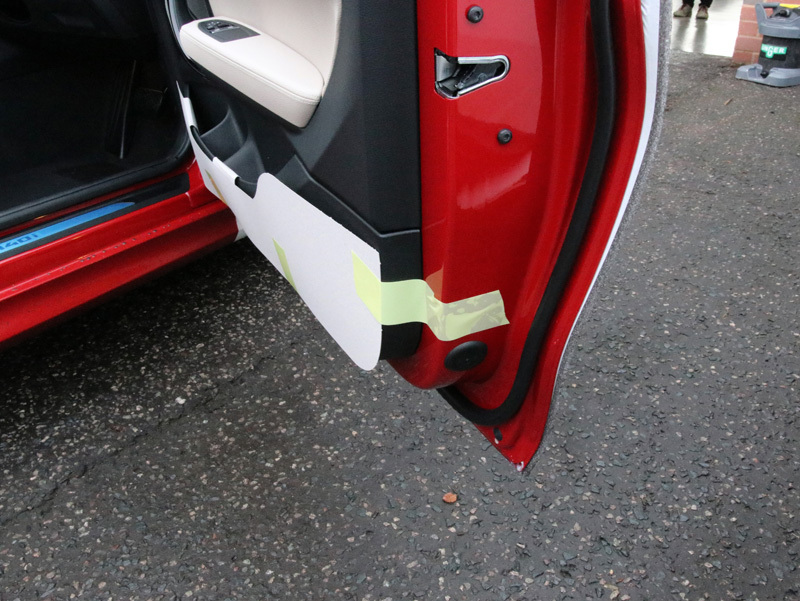 The protective strips were carefully removed from the exterior of the vehicle. 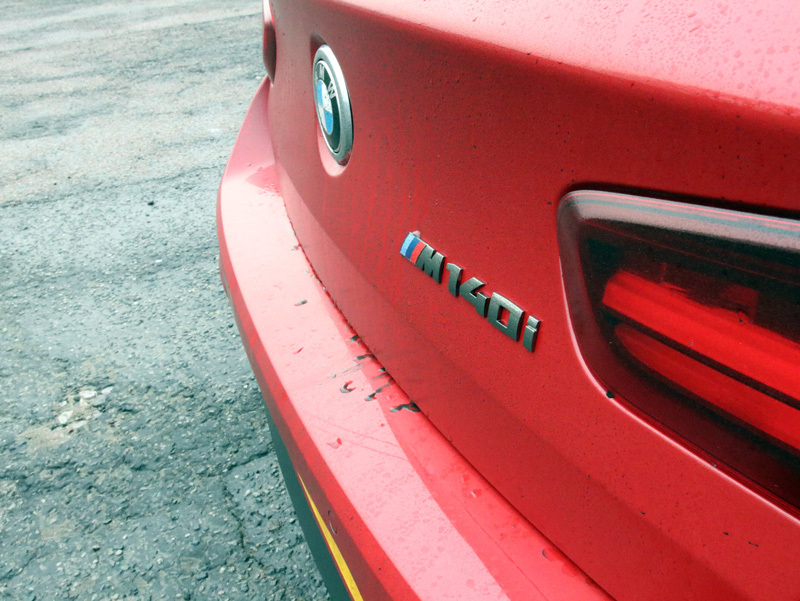 Unwashed by the dealership, the M140i had been driven to the studio, collecting dirt and debris from wet roads. 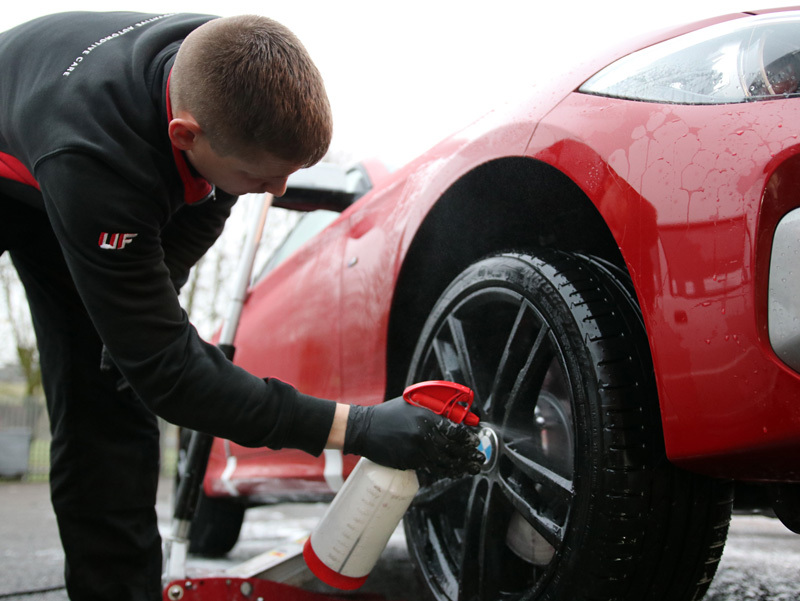 An iron contamination remover is sprayed onto the wheels to tackle brake dust, derived from brake pads which shred when the brakes are applied. Tiny particles become aerosolised, bond with the first substrate they come into contact with and quickly begin to oxidise, swelling as they do so. 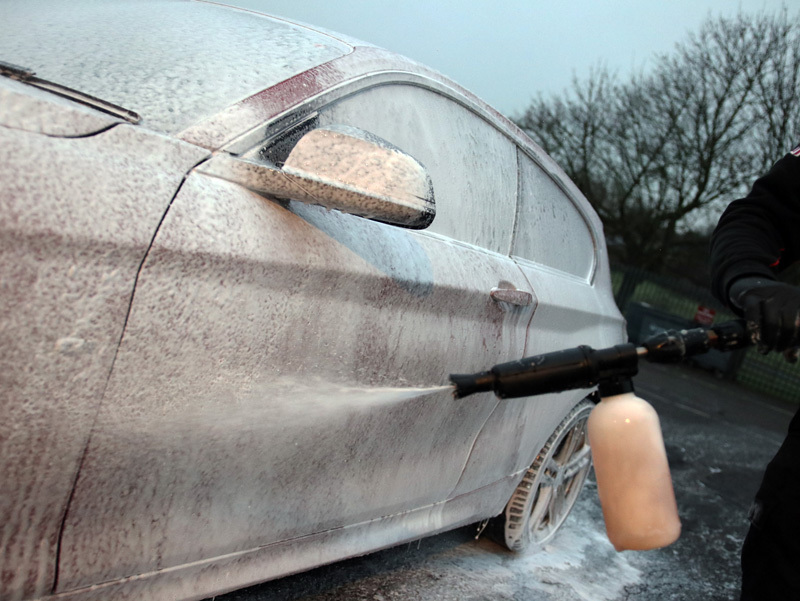 Scrubbing at these particles with a wash mitt is ineffectual and any that do break loose are rubbed back and forth across paintwork or wheel lacquer, causing swirls and scratches. Therefore, using a dedicated product with an active ingredient that shrinks these articles is a far safer and more effective method of removing them. A degreasing solution is sprayed onto the vehicle to ensure greasy road grime and residue from petrol or diesel splatters are removed. Special attention is paid to wheel arches and fuel filler caps which are the most likely areas to attract this type of contamination. 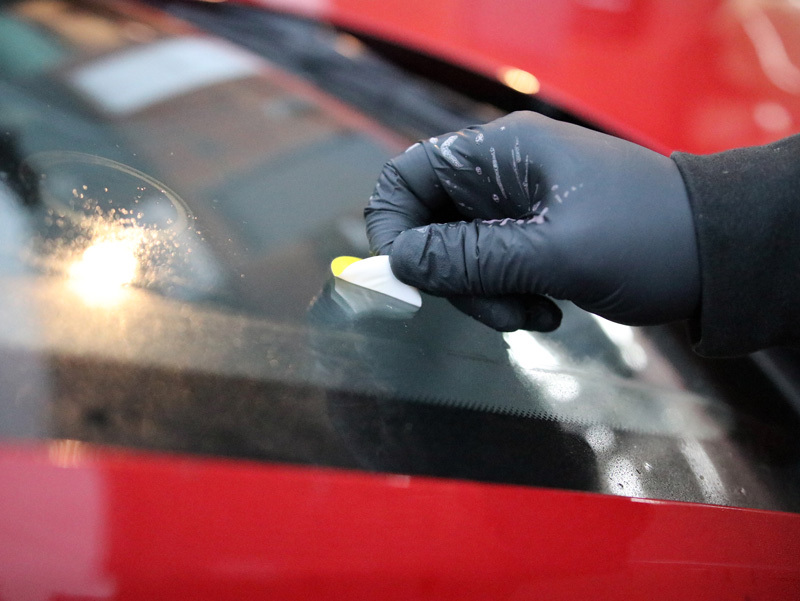 An adhesive remover is sprayed over the vehicle to ensure not only that residue from transportation film is removed, but also tar deposits and tree sap are dissolved. The car is then rinsed again before being pre-cleaned with a snow foam product to remove larger particles of dirt and grit from the surface. The wheels are washed using water kept separate, in order to prevent cross-contamination from the dirtiest part of the car onto the panels. The bodywork is washed using the Two Bucket Method, keeping wash water in a dedicated Wash Bucket and Rinse Water in a separate Rinse Bucket. Both buckets having Grit Guards fitted in the bottom for the wash mitt to be brushed across, releasing dirt from the mitt. This way, the wash mitt is kept free from particles and the wash water is kept clean, without dirt swirling around in it to become re-attached to the mitt and then transferred back onto the paintwork. Suds are rinsed away before an Aqua Gleam De-ionising Water Filter is attached in-line for a final, pure water rinse, preventing white watermarks from forming. 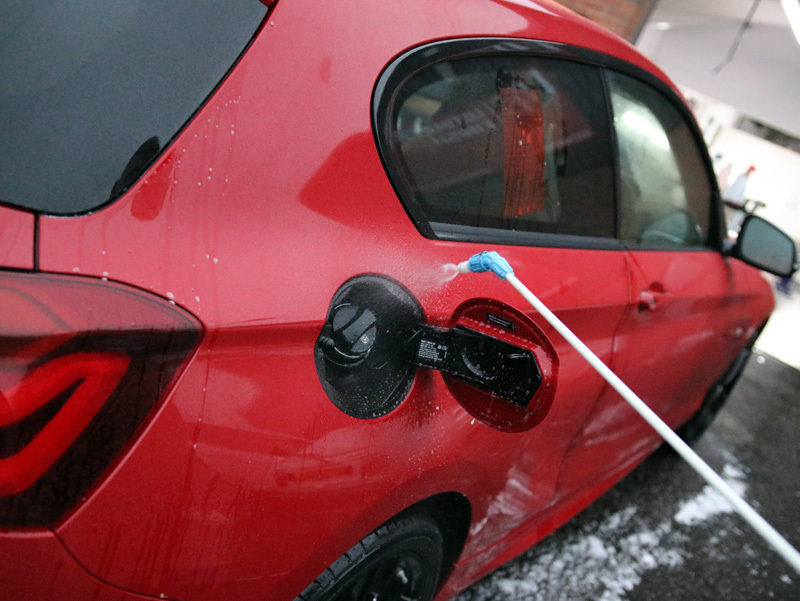 Once the car is clean, it can then be properly inspected for marks and blemishes. First, an overall check is made and notations made on the Vehicle Appraisal Sheet. The vehicle is then brought into the studio and dried using a touchless car drying system which chases water off the panels and out from behind natural trap areas, such as around badges, grilles, recesses and mirror casings. 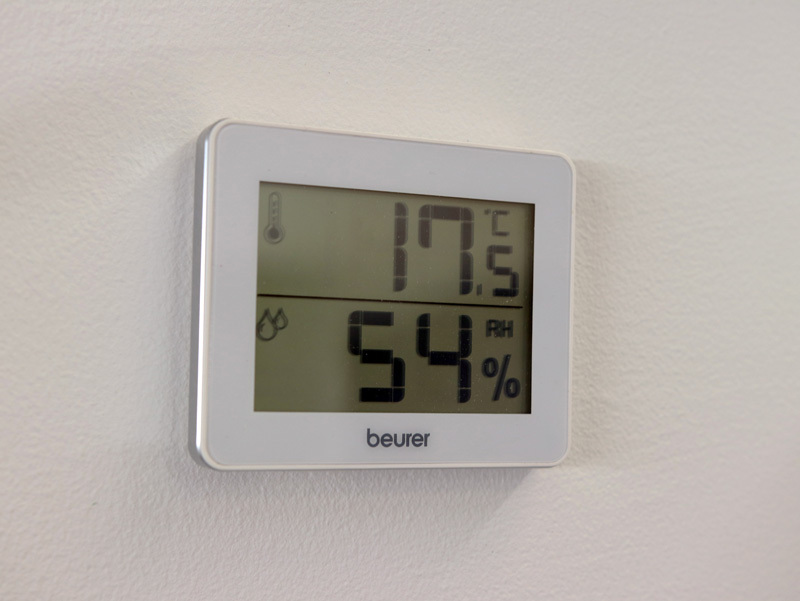 The touchless system also removes the chances of damaging paintwork with the edges of a drying towel. 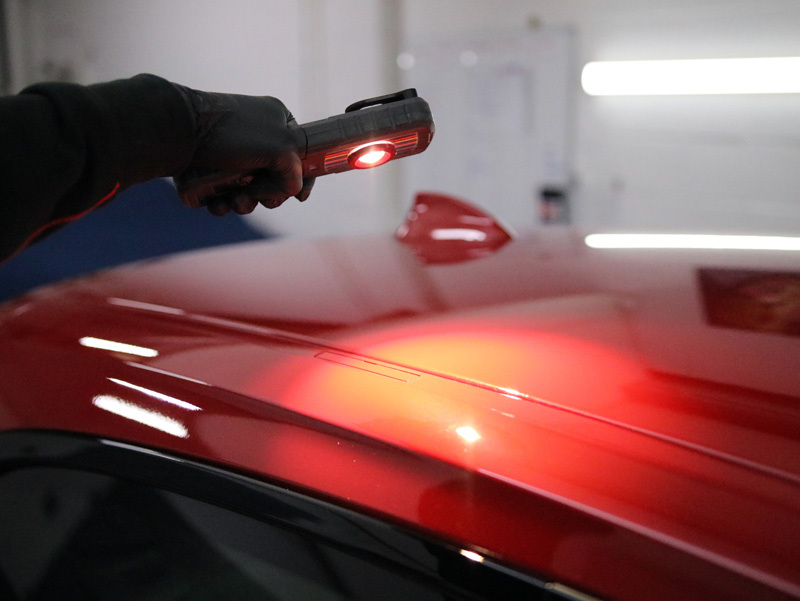 Once dried, the car is inspected under high-intensity lighting to reveal any scratches or swirls, stone chips and any other blemishes, all of which are noted on the Vehicle Appraisal Sheet for future reference. 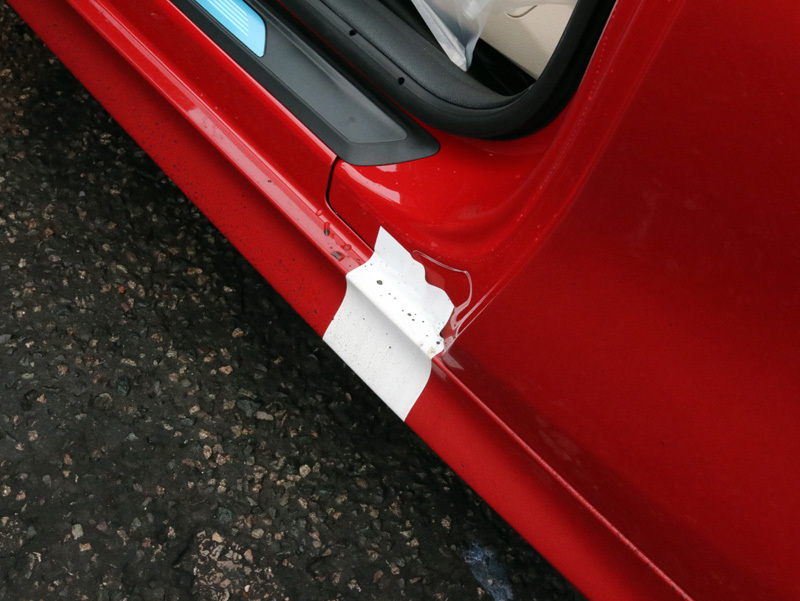 Multiple paint depth readings are taken over each panel to check the thickness and uniformity of the paint covering and to highlight areas that may have been damaged and ‘smart repaired’ prior to delivery. A light refining polish is carried out by hand using Polish Angel Esclate, a highly effective cleaner polish which improves the shine and colour intensity of paintwork without the use of fillers. The bodywork is then prepared for the coating using a panel wipe solution to ensure all polish residues are eliminated prior to the sealant application. 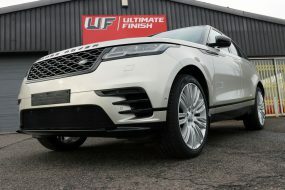 Having been involved in car care and detailing since 1998, UF has extensive knowledge of and experience using a range of nanotechnology-based ceramic coatings. The most advanced coating available is ENREI, a two-stage coating system engineered by Kamikaze Collection, a boutique Japanese car care products manufacturer. No. 1 Base Primer Coat is applied first and has been formulated to have an increased chemical affiliation with the components in the No. 2 Top Coat. This ensures maximum longevity and, due to the close-knit bonds formed, presents a higher level of protection over standard ceramic coatings. Many ceramic coatings are susceptible to water spotting as moisture becomes trapped as the coating cures, marring the overall appearance and interfering with the formation of the bonds. 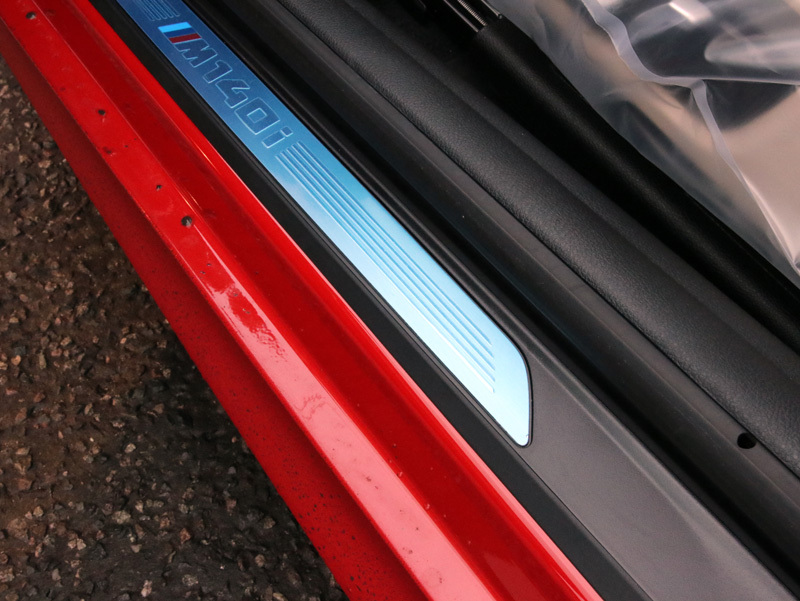 Once cured, ENREI provides a slick, hydrophobic surface that encourages rainwater and contamination carried by it to sheet away from the car’s panels. Impervious to extremes of pH, ENREI will not be degraded by industrial and environmental fallout. It’s not only the chemical formulation that makes ENREI a successful coating. Extensive research has also gone into the application method for laying down both Primer Coat and Top Coat, as well as the optimum method for removing the excess. Ambient air temperature and humidity must be within specific parameters to ensure the coating cures to the optimum hardness and that moisture does not become entrained in the coating during curing. Unlike dealership supplied coatings that can be applied with little regard for preparation methods, ENREI is available only through detailers who have been trained and approved by Kamikaze Collection. Correctly maintained, ENREI will protect the car for in excess of five years whilst ensuring the car is much easier to keep clean. 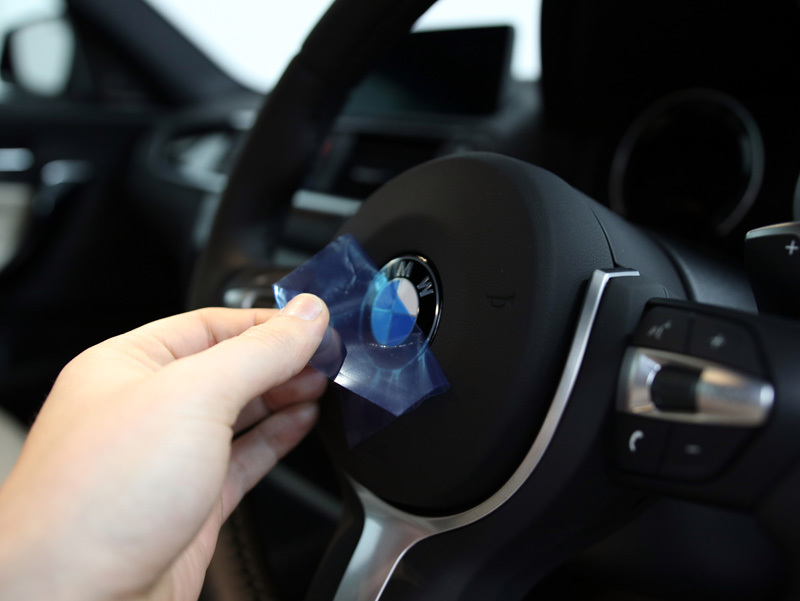 Protection film is also found on the interior of a new car, preventing sensitive enamels, metals and details from being scratched or damaged. These are removed and the areas cleaned to ensure no sticky residues remain. Protecting new leather is an important step in the protection process. Exposed to UV, leather dries out, becoming brittle and susceptible to cracks and tears. In addition, UV rays fade dark pigments which eventually will mean the leather needs recolouring to restore its original appearance. The leather can be preserved for longer if an abrasion resistant, UV protective coating is applied. 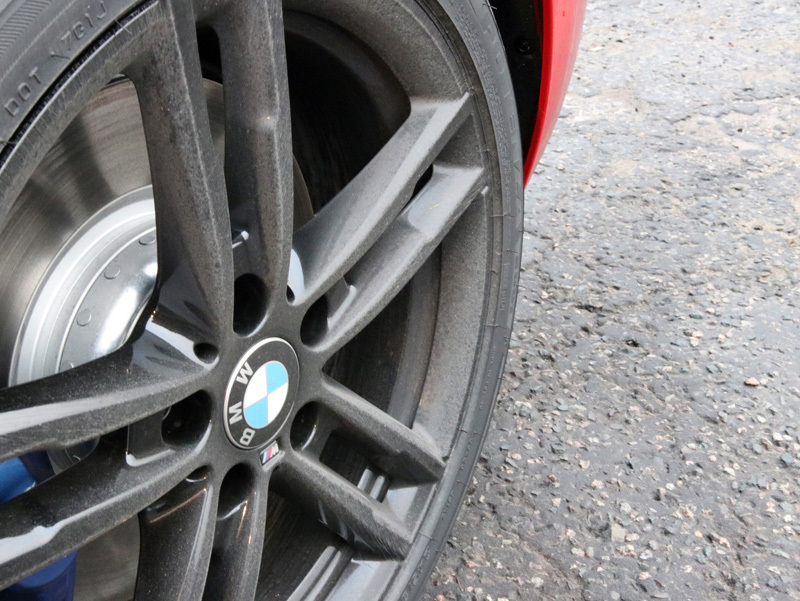 Alloys wheels are an expensive component and pick up the worst contamination from the roads. 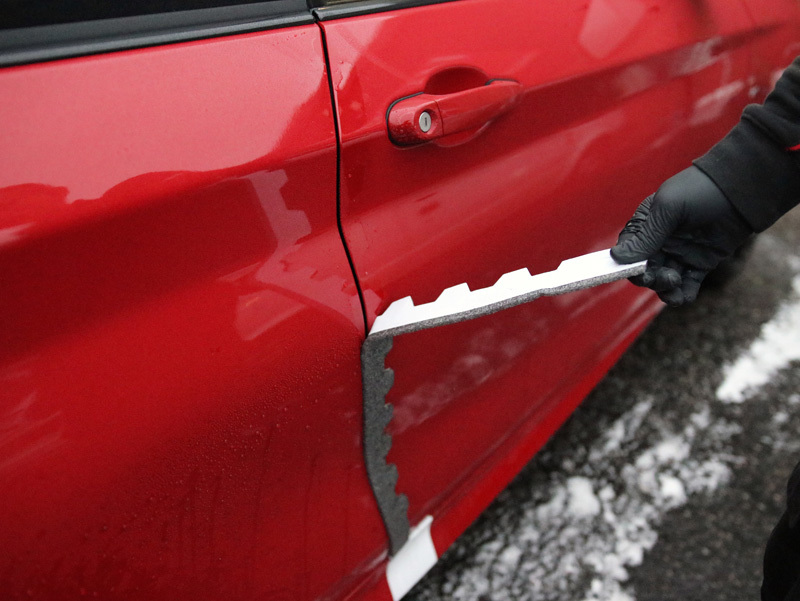 In winter, this can be particularly destructive as salts and grit used to prevent ice forming on roads immediately begin to attack and corrode wheel lacquer. Using a nano-ceramic coating specifically designed to withstand the testing conditions wheels face is the most effective way to protect them. The coating should be heat resistant so it will not burn off when the wheels become hot through use. This coating should also be applied to the brake calipers, a fiddly task requiring time and care to ensure the protection is comprehensively applied. 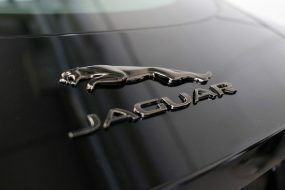 As part of a New Car Protection Package, a hydrophobic coating for the windows should be offered. This is particularly important for cars without rear window wipers as it helps water and contamination to bead away from the glass, keeping it cleaner for longer. 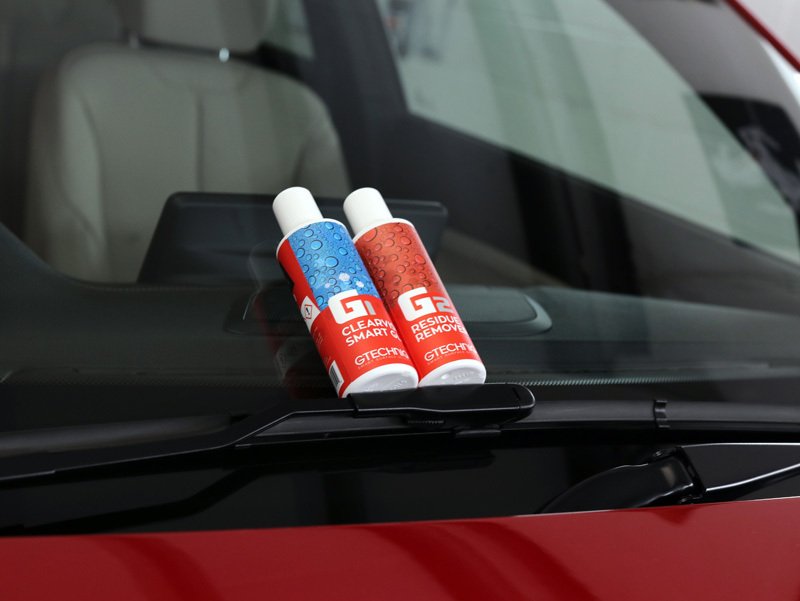 For the windscreen, this coating helps to increase visibility and make conditions less tiring for the driver during inclement weather. In the winter, this type of coating has the additional benefit of inhibiting snow and ice from adhering as firmly to the glass, making early mornings starts quicker and easier.